We were in flatter water, the winds were more agreeable, but we weren’t interested in the Abrolhos Islands anymore, preferring to hug the coast, where the SE’ers can’t mess with us. 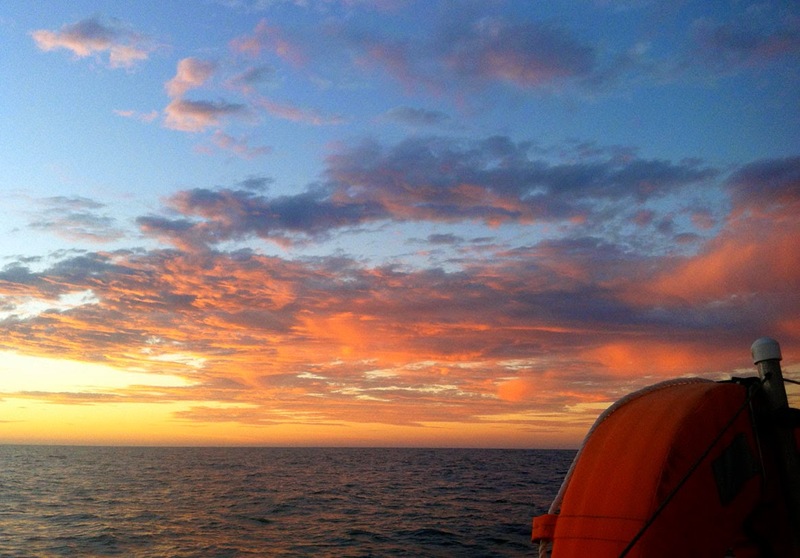 The next destination would be Geraldton, major port 200Nm north of Fremantle and 150Nm from our position. 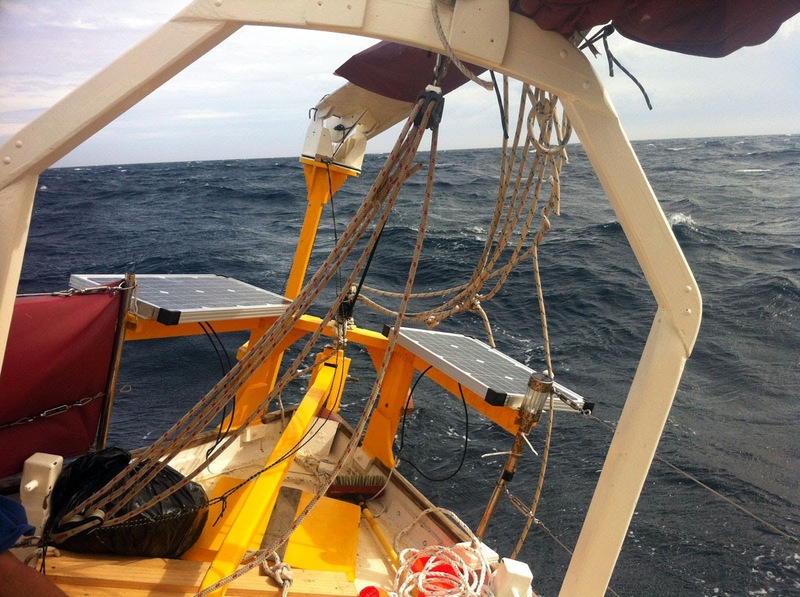 By mid morning winds had dropped to under 10 knots between S and SE and we were crawling along 1.8 to 2.5 knots. Took all day to pass Cervantes (home of the Pinnacles Nat Park). While being thrown around in that gale, I would have given anything to be becalmed, never complain about it again and by the end of the day, thats exactly what we were. Windless and drifting in the 1/2 knot current. 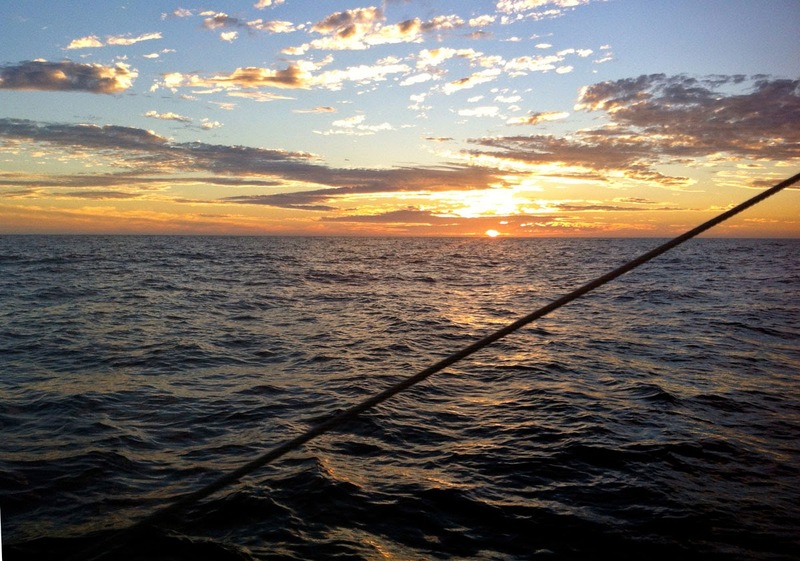 Obviously the forecast "storm" did not eventuate, so dropped the sails, hung our only sea anchor from the stern and went to sleep, 14 miles off the coast, little north of Cervantes. 6 miles in 8 hours that night. We both felt some sickness, it was taking a while wearing off, but we were eating again. Conditions in a calm boat are much better. We made a measly 38 Nm the last 24hours. The wind didn’t come back till 11am. We were drifting for hours, which is not a problem by the way. No schedule to keep, apart from leave the south before winter, and with a boat well enough provisioned, we had no inclination to waste petrol on that noisy outboard. Besides, we only carry 37 litres of fuel and so far have burned it at a rate of 6 litres a month. At one point a pair of birds, some kind of sea terns took a liking to our boat, one landed on the furled main sail bundle, the other in the cockpit and wouldn’t leave! They seemed tamed. I had to shove the one off the sail and scooped the other with a bucket. When I tossed him overboard, the bucket went too. Lucky we have a another four. Never leave port without at least 5 buckets I say. They have a million uses. Then there was the moth infestation, 13 or 14 miles off the coast there is still all this wild life. We had our hands full swatting moths out of the cabin. Moths onboard means, eventually, holes in our clothes and weevils in our food. So those little annoying creatures had to go! I think there is still hope for our world when you could be miles from land and the air is still thick with birds of all kinds. That they eke out a living out here is hard to fathom. Two days ago when I was sick and sitting in the cockpit just to look at the large waves sweeping under our hull, I marvelled at the Shearwaters, they’d swoop low into the troughs, disappear between them, out off sight then appear again soaring up the next watery slope. It was fine precision flying. 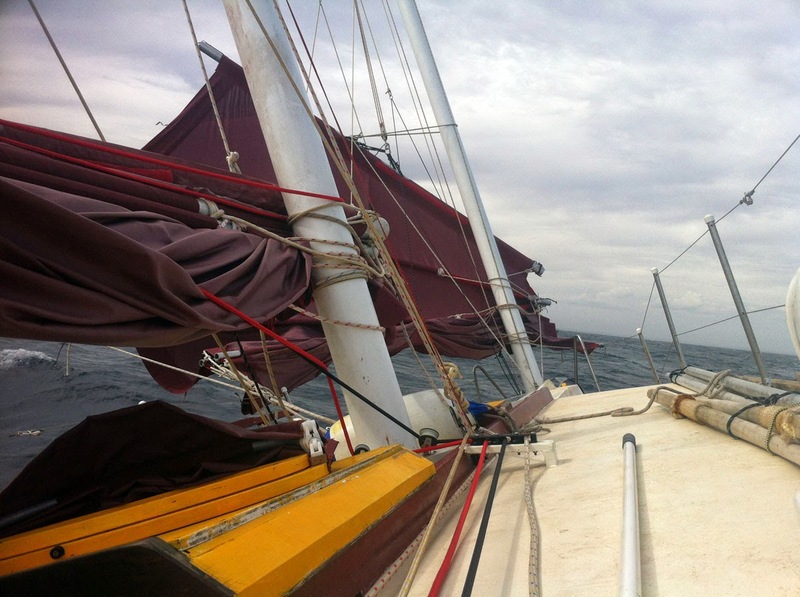 Day 4 out from Fremantle we made 65 miles and becalmed at night yet again, opposite Leeming. At least I was finally getting over sea sickness and eating full meals. Susie could only manage half her dinner, she suspects we had suffered food poisoning rather than sea sickness, from the 3 day old mince beef we ate the night before the storm. We opted not to visit the harbour at Jurien Bay, hearing it over priced and under serviced (all that money for a cold shower!) and miles from the town. Reefed down to only 2 panels on the foresail and none on the main, junk version of a storm sail, still bowling along but steering was very easy. Day 5 the wind picked up and by midday it was 20+ knots on our stern. Ashiki was hand steered at 5 to 6.5 knots for sometime until Susie wanted a more manageable tiller, it tends to be hard to hold at these speeds, probably due to do with the fact there is no skeg in front of the rudder. Disadvantage of a spade type rudder, so we reefed down drastically, still sailing close to 5 knots but much more docile steering. At this rate mid afternoon arrival at Port Denison became a possibility. 1 to 2m waves were rolling under our hull, one advantage of a double ender hull, no wave slapping on the transom, because we don’t have one. The ride was fun and cushioned too, the hull shape meant she rose to meet every swell but not abruptly. I think the fine ends, bow and stern make her more comfortable. 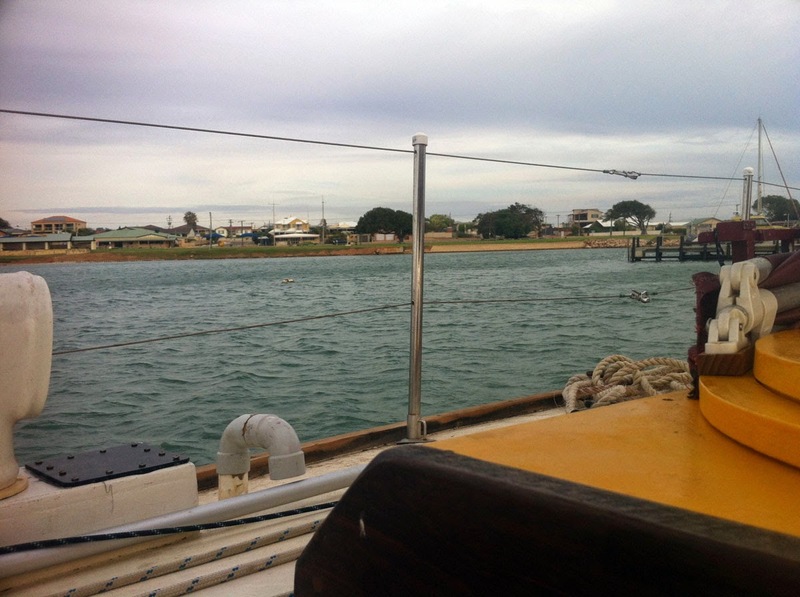 We entered Port Denison before 5pm and picked up a mooring, our first harbour in 4 days. Longest period spent nonstop on a voyage so far.